FenwayNation—Red Sox, Mookie, J.D., Bogaerts, Sale, JBJ—Founded 1/27/2000—9-Time Champs: Are Hosmer And Davis On The Red Sox Trade Radar? 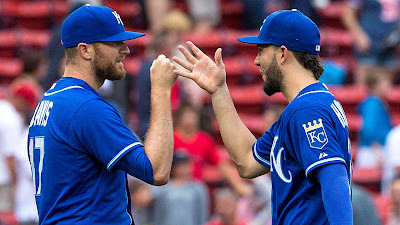 Are Hosmer And Davis On The Red Sox Trade Radar? According to The Boston Globe's Nick Cafardo, a surprising player may be on the Red Sox radar screen—Kansas City first baseman Eric Hosmer. Another Royal—relief pitcher Wade Davis—could be part of a trade package as well. There's no indication of who would need to go back west for these players, but any package would certainly be less than what's been cited in any potential deal for Chris Sale. With the 27-year-old Hosmer, Boston would get a left-handed hitting power threat in the middle of their lineup—and a first-rate defender. This would also allow Hanley Ramirez to slide into the DH role. In six MLB seasons, Hosmer is a .277 hitter with 102 HRs and .763 OPS. Davis—a guy Dave Dombrowski has lusted after for a while now—would be a perfect 8th-inning weapon out of the bullpen. Stay tuned—the Winter Meetings begin today!